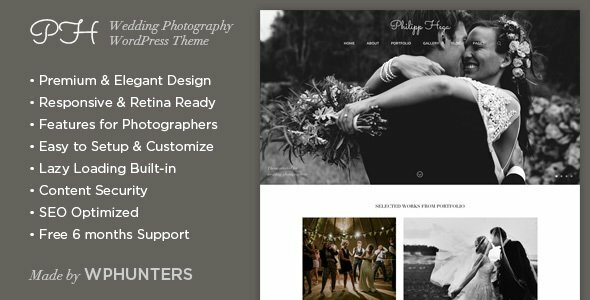 PH – Responsive Wedding Photography Portfolio WordPress Theme is designed for wedding photographers and professionals in the same line of work. The theme has a clean and functional design which is best suited for the wedding photographers. The theme is created while focusing on the needs of the professional wedding photographers to showcase their photography portfolio. With powerful content management tools, you can use this theme to create a stunning portfolio. Moreover, the PH – Responsive Wedding Photography Portfolio WordPress Theme is highly responsive and works equally well on every modern device. It is niche specific design with functionality to attract your potential wedding photography, customers. This wedding photography theme is focused on content and portfolio of the services. If you are looking to showcase your work and portfolio with a simple yet attractive design, then PH – Responsive Wedding Photography Portfolio WordPress Theme is the best option that you can use. The theme has multiple pages including booking page, pricing/quotation page, and customer reviews. This theme can help you portray the perfect image of your work. You can use the unique and attractive portfolio gallery to showcase your existing wedding photography samples. The theme is designed to give improves and unique user experience. For all those who are trying to capture the online market for providing wedding photography or similar services, this theme is the best way to capture the market and potential customers. The theme is well designed with compatibility to the most used plugins. Moreover, we provide the top-notch customer assistance in all of our WordPress themes. The theme is compatible with all latest software versions and has cross-browser compatibility. - google fonts loading moved to wfl library, now your site will load faster! Images are used just for DEMO and are not included in download!